I’ve finally gotten around to writing up a bit of an AAR on my matchups with @jp82729 (https://armadaaarsbydave.blogspot.com/2019/01/vassal-wc2019-commanderdave-vs-jp82729.html) and @The_tony_davis (https://armadaaarsbydave.blogspot.com/2019/01/vassal-wc2019-commanderdave-vs.html). There it is for those who may be interested. In what can only be described as advanced space ship ballet (kudos to all navigators involved), Neb squeezed out a 50 to 31 win. Bantha took 1st player and chose Solar Corona. Having no last and no first (at least until I kill something and lose nothing) was always going to be a challenge, and Banthas ships are flexible. Thx Bantha, truly pleasant to play you, hope to see you again at next DM. Zamalekite vs @Dark Raver Pod 6 match ended in an 0:0 which I believe is a 6:5 win for Raver. Raver had the bid and chose second. I selected his Planetary Ion Cannon which I was promptly able to move out of the way with my VCXs. We deployed diagonally opposite each other with my ships facing forward slightly to my right and his ships facing forward further out on his right with the flagship right on the far flank. Turn 1 I headed straight forward at full speed and moved my squads towards his ships. Raver slowed his Pryce Kuat to speed 0 and swung his flagship ISD II in a bit. From Turn 2 onwards it was a game of chase the ISDs. With 14 hull each to chew through I unfortunately wasn't able to score any points and towards the end had to withdraw a couple of squads having taken hits from flak damage. Glad this wasn't a knockout match is all I will say! I believe the Tokra v Raver match last night was similar - I just wish I'd known in advance! Might have done things a bit different but very tricky to get have to chase Motti ISDs! @clontroper5 v Brobafet is finished. Initiative = tie - Broba wins the flip and picks first. You know how sometimes the score is so completely wrong when you actually play the game and know what happened? This is one of those cases. Game ends with the table with quasar at 4 hull no shields, ISD at 3 hull no shields, and multiple squads at 1-3 hull. My fleet was hanging on by duck tape, but being able to spread the damage around meant nothing died and when the ISD fell top of 6 the score skewed hard my way. Clon is a great player, and truthfully we both deep down knew a large portion of this game came down to who won the roll. I got it, which meant I got to play my game and Clon really couldn't coutnerplay against it much. Top of 2 I launch everything at Demo, putting him at 3 hull and almost no shields. Demo counters on the quasar and just rolls incredibly poor. Front arc was blank blank double hit, and side arc was blank hit hit hit. 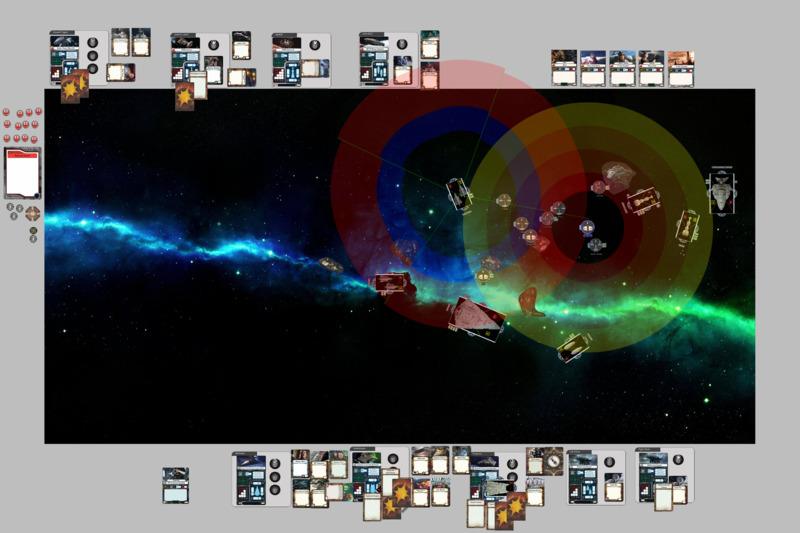 Quasar with brunson and tokens shrugged it all off remaining pretty healthy at 5 hull and 2 shields on the far side. Once the demo moved past, the ISD was too far away from the quasar to threaten it, especially with thrawn navs keeping it moving away and accross the bow of the ISD. With the quasar in the clear he moved the ISD up slowly and I moved the ISD into a position where I could activate the quasar first to kill demo and not eat kuat RIGHT AWAY. 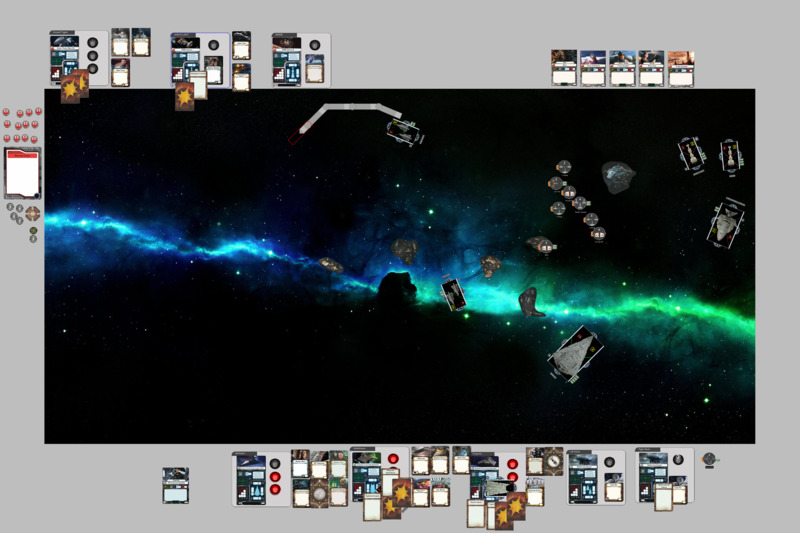 turn 3 quasar activates, and kills demo, looping around a debris to score late game CO tokens. Clon SAD's and I move my ISD into a close range kuat shot, after launching bombers and a front arc into clons ISD getting 2 hull on it. Clons kuat pops BT and triggers avenger for 8 + apt, APT crit of course pops proj misaligned and now my fully healthy ISD is almost shieldless and at 6 hull. Clon moves around me to try and score the CO that I was body blocking, but misses narrowly. Turn 4 i activate the ISD and throw all the bombers and fly it out of the way, but into a mid range double arc. Clons kuat, now at 5 hull and 2 shields on a far side, shots at the ISD taking it to 3 hull and parking on the station for another token. The quasar strips the shields he brought up with his repair but can't chip through to add hull. But now the ISD is locked into all repairs to try and tank bombers while the quasar is now in perfect position to score the station and chase after the ISD, keeping the squads on target all the way to the end without putting the quasar in danger. Turn 5 and 6 the quasar scores the CO and sends fighters while the ISD runs and Clons Kuat desperately tries to use it's leftover shields to keep alive and keep the MOV down. Turn 6 Maarek Jendon dashes those hopes and the game ends lopsided my way. Clon is of course a great opponent, and both of us are eyes wide open that in this particular matchup whoever was second player had the uphill battle so I will give him that. Also, Clon deployed and placed objectives expertly, a testament to his ability. I took like 8 debris damage over the course of the game because he forced me to run them over to make the plays I needed to win. It almost was enough for him to crumple me. Great game Clon, always a pleasure to play such a great person and opponent. Sorry for all the typos- hope you can follow it! it's a rush job. Got kids that need baths! thanks for the Gracious write up @BrobaFett,it was a pleasurable game! although somewhat frustrating at times ha ha, anyway does it sound like a game you wished you had watched? @Tokra, @Dark Raver - no one has reported a match between you! Score updated through this point. I mean, for what it's worth, I think its an amazing game to watch because it's action turn 1 to 6. It was massive stressballs for us playing it, but truth be told from a third party watching perspective, this is about as action packed as armada games get. I'll sure give it a watch! Sounds like a great game. Ups. Sorry! Just thought that @Tokrawould post results since iam a very quiet member of the forum and always have the feeling that it would be a pleasure to my opponents to do so. I apologize to @BiggsIRL for misinterpreting the Situation and not get you the results. Also a big sorry to @Zamalekite who ran into this lame mess without knowing my game with @Tokra. I had initiative and chose 1st. Final Score: 475-0 for CommanderDave. That one hurt. I chose FA and kept my HIE deployed in order to get deployment and activation advantage against Dave and his squads tore me up.Turn 3 I dropped the MC-75 in a nice double arc of his Interdictor and also had demo double arc'd with Admo. Both my ships proceeded to whiff and the game quickly (it was going fast at this point) spiraled out of control. Very well played by CommanderDave, he earned every point of this one. The Interdictor escaped on 1 hull and Demo survived on 2 or 3. Good luck next round, win one for Pod 5! GiledPalleon is a great opponent and a great sport even when I'm constantly breaking vassal. I'll post more details tomorrow and he'll post the log file. The score really doesn't do the game justice as it was pretty close all the way to the final rounds. That interdictor is crazy tanky. Pod 7 Raps up with a Dramatic Showdown Between ISDs and Demo's and Gozanti Cruisers. I was somewhat Nervous going into this game I knew @thecactusman17 is a good player and he had a couple distinct advantages over mine that if he was able to exploit could be very bad for me. Besides after my Lose to @BrobaFett a solid win by @thecactusman17 could very well knock me out of the tournament! not a very good show for the First Champ. Anyway he handily outbid me and opted to be first player choosing my Contested outpost. we deployed basically across from each other, with his Raider and Demo lined up opposite my Kuat, while my Demo supported by Suppressor, Squared off with his ISD. turn Two: the tension builds as ships dance around the ISD's deadly frontal arcs, after a Emergency Ram into Supressor my Demo is able to comfortable stay at long range of the enemy ISD and out of Decap range of his Raider as well, this followed by a leap forward from my own Kuat to snag my opponents Demo in its front arc at close range. This means that @thecactusman17 ships are forked at the start of round 3. My squads continue to pour damage onto His ISD and its starting to pileup. and Again the Station is mine for the taking. Turn three: @thecactusman17 is now faced with a choice, he does have the advantage of First player but what should he do with it? on one hand he has my Demo a sitting duck in his ISD's front arc, with a fulll complement of dice boosted by XI7, on the otherhand, my kuat is Barreling down towards his own Demo and it looks like it's Hungry. after contemplating his options he elects to Activate the ISD Blasting the side of my Demolisher and inflicting heavy damage, but alas it was not enough to to be fatal and after a ram which clipped his own Gozanti the ISD sat in place. Now it was my turn, my Kuat reveals a Squadron Command and then spends a formerly banked squadron token to launch its deadly Boarding Trooper against the Poor Demolisher leaving it defenseless against the deadly salvo from Avenger. Next it uses the Squad Dial to reroute Meerak and Jendon away from the ISD and into the Enemy Raider which is attempting to flee doing a couple points of damage and burning its Brace token. Now the Kuat fires and after a merciless volloy of 8 damage plus an APT crit, @thecactusman17's demo is obliterated, removing Motti(who was on board) from the game. a follow side shot finishes the Raider off as well and suddenly the game has a very different feel then it did before. My Demo pours a volley into the enemy ISD proving that Luck is not with him this turn when the APT crit flips Depowered armament, perventing the ISD-2 from useing its deadly long range guns and dashing any hope of finishing off my demo as it Speeds away using Engine techs to a safe distance. 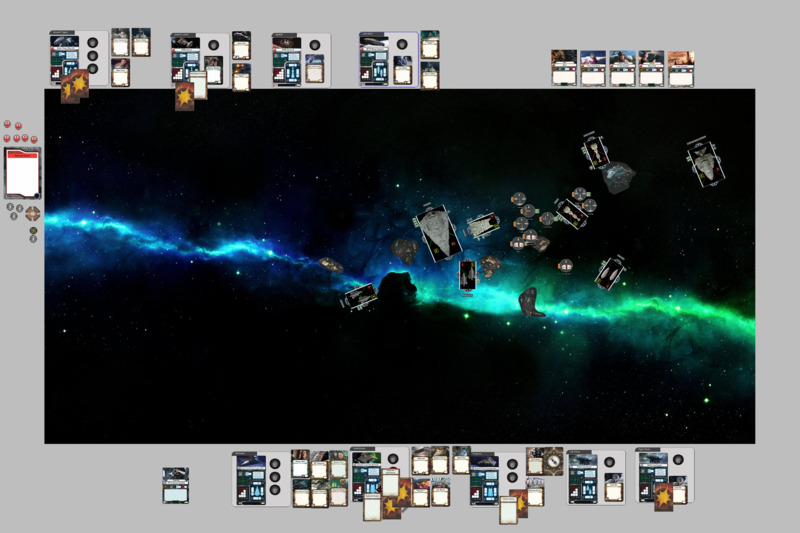 Morna diligently continues pouring damage into the ISD which is now out of Shields and without Mottis HP it quickly running out of hull, this forces him to discard the precious brace token. Turn 4: His ISD is starting to run out of HP from the Relentless bombs and now its running out of optionsForced to activate first inorder to avoid a deadly shot from my Kuat it is unable to target my Damaged Demo and is only able to inflict some superficial damage on My Kuat. 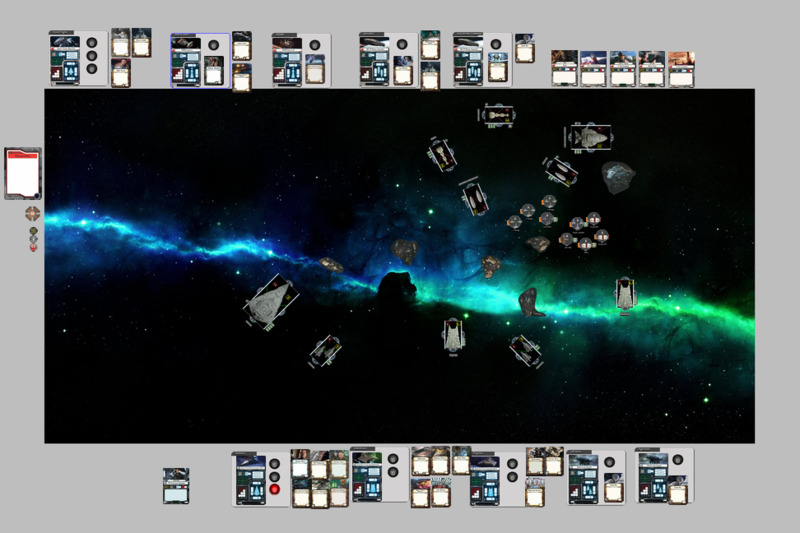 the Next activation comes as a squadron command from my trailing Gozanti which pulls Meerak and Jenden back from the Wreckage of the raider to put 4 more damage cards onto the isd, and then to add insult to injury, the Gozanti fires from its Left side rolling 1 more damage to kill the ISD. the game is now over as @thecactusman17 has run out of combat ships. Thanks @thecactusman17, You were an excellent and Worthy Opponent and wish you luck in your future matches. We will have to rematch one of these fine days. Really good game. He came very close to knocking out the Dictor, but my Scramblers won through and it managed to escape destruction. My game vs @Angry Ewok is done with 9-2 win for me (472-196 MoV 276). Angry Ewok was first player and we played my Most Wanted. He set up Ackbar bowl of death perfectly and got my ISD separated from Gladiator escorts (I don't think my Demolisher shot even once the whole game) and fighting alone, however the game was decided by unlucky roll from Ackbar that couldn't get an accuracy on a killing shot (which allowed ISD to live one extra round and to finish up both corvettes). Next round Gozanti managed to deliver a crit to Ackbar robbing him of a nav dial which at speed 3 sealed his fate by forcing him to fly into sunset later that round (and gave me the tabling). So, I definitely got several lucky breaks this game which otherwise would've been a solid win for @Angry Ewok - an excellent and gracious opponent. This game comes down to 1 pixel on turn 3 as Liberty kills Demo with just enough damage due to being in blue rather than out. It then proceeded not to die after being battered by YV's for so long. Good game to Ninja, its always a pleasure to play. This was a tough matchup for him, and I was able to snipe Mothma early with a good roll. It was all downhill from there as I was able to pick off Ninja's fleet one ship at a time. Round 1: The rebels ponder how they're supposed to fly away from the Cymoon and Demolisher in this situation. Cymoon cuts in hard and Demo eyes up the main rebel ships to demolish. Round 2: The bombers get one round of strikes on Demo, stripping its shields, but its last-first will put it out of reach of anymore bombing attacks. When Demo does move in, it's just shy of getting to intel-officer-murder BCC's scatter with its side arc. Instead, it engine techs to line up the kill on the assault frigate. Round 3: Demo rips apart the AF with its side attack, but the front shot isn't a guaranteed kill, so instead it moves and tries to pop Dodonna's corvette, but that falls just short too. Demo ends up getting farmed for a decent number of victory points before it dies. The Cymoon is already clipping the other corvette, so it flees, sacrificing Toryn's flotilla to get mauled by Vader's gladiator (side accuracy on the glad-2 for the kill). But right afterwards, the Scurrgs hop on that gladiator too. Round 4: Lucky/unlucky rolls slowly whittle the glad-2 down to nothing by the end of the round, with a large victory token pull to show for it. Meanwhile, the Cymoon whips around the board like a corvette, and the rebels are just praying it can't line up a gunnery team murder shot on 2 ships in round 6. Round 5: The Cymoon's experimental mini Death Star laser deploys and vaporizes Leia's bomber command center. the lumbering half-dead AF slows to avoid the angry Cymoon, and all the rebel squads finally jump Ciena to finish her off. Round 6: The Cymoon forces the assault frigate to activate first, but misses its long range shot by a hair. The corvettes flee as quickly as they can. The epic rebel squad bust up of Pod 6 between me and @Tokra is over! I got the tabling with a 400:191 win so an MOV of 209 and an 8:3. Tokra had the bid and chose 1st picking my jamming barrier which he then proceeded to make more use of than me! I lost the squad battle but managed to manoeuvre my ships to pin his MC80 on an asteroid and basically ram it to death over a few turns whilst staying in the front arc most of the time. Score doesn't reflect how close the game was and a crucial miss from Dutch on Corran kept my squads in the game just long enough to not allow him to bomb my ships. @rasproteus, @Maturin, @MandalorianMoose, @themightyhedgehog - you guys out there?